The ABC Baby Gift Box is the perfect present to send for baby’s arrival. Presented in a unisex cream box we have combined some lovely gifts to treasure. The perfect way to send your congratulations for the new bundle of joy . 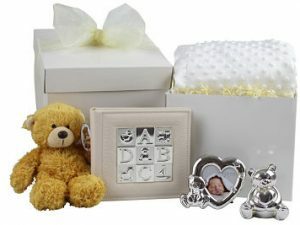 The Baby Bear Gift Box is filled full of perfect gifts to treasure for ever. 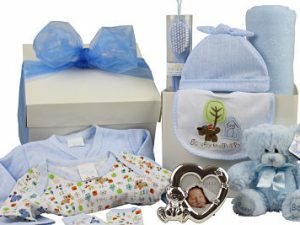 The Baby Boy Gift Box contains a superb selection of gifts for baby’s arrival. A baby outfit, soft cosy blanket, cute fluffy teddy and a photo frame to treasure those precious memories. The Pampering Bath and Facial Gift Box, provides a luxurious box of lotions. Invigorating skin products and bath bubbles with delightful scents. Revitalising shampoo and nourishing conditioner pampering you from head to toe. Choose from the Mischief or Spa Lifestyle range. 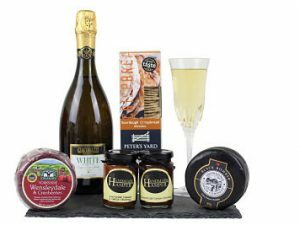 Why not add your favourite bottle and chocolates to make this a super luxury treat. The Bathtime Baby Gift Box – Blue beholds a cute hooded wrap and a super soft sleepsuit to accompany all other bath time essentials. A perfect gift for a newborn prince. Choose your favourite bottles from our selection of fine ales, craft beers and delicious ciders to accompany the tasty treats within The Beer & Cider Pick n Mix Gift Hamper. A sensational gift teaming for any occasion. 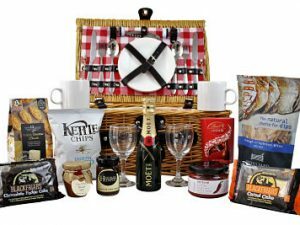 The Beer and Nibbles Gift Hamper is a not one to be missed. Choose your two favourite bottles of beer from our superb range to accompany the tasty treats.